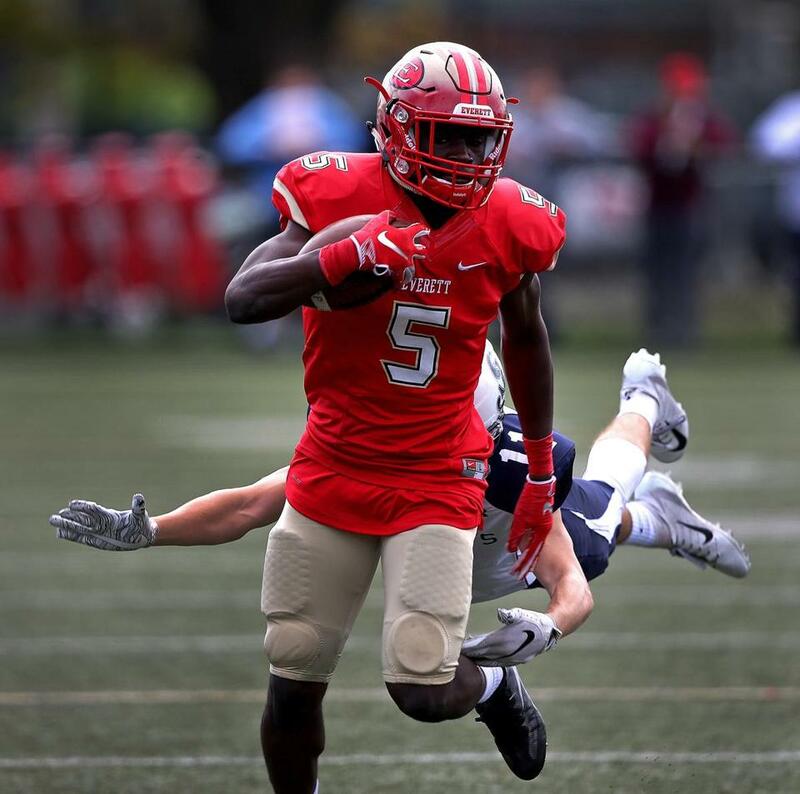 Everett’s Mike Sainristil, a Virginia Tech commit, has emerged as a dynamic triple threat (offense, defense, special teams) for the Crimson Tide. Why is Everett senior Mike Sainristil arguably the most versatile football player in the state? In the scoreless first quarter of a season opener at Xaverian, Sainristil lined up to punt on fourth-and-14 from the Everett 38-yard line. He leaned down to catch a low snap as it hit the turf, and glancing up, noticed that all the Xaverian defenders were backpedaling. So, the 5-foot-10, 165-pound Sainristil took off down the sideline, picking up 16 yards and a first down with his blazing speed. Seven plays later, Sainristil snared a 20-yard touchdown pass from Everett quarterback Duke Doherty. The Virginia Tech commit added a 50-yard touchdown reception and ran for another first down as a punter, leading Everett to a 34-21 win. “[Sainristil] is such a good athlete and beyond that, an astute football player,” said Xaverian coach Al Fornaro. After totaling 13 total touchdowns, 33 tackles, and four interceptions as a junior, Sainristil has tallied 173 rushing yards, 313 receiving yards, three interceptions, and six total touchdowns this season for the two-time defending state champion Crimson Tide, who have now won 24 straight games. While few playmakers can rival Sainristil’s game-breaking athleticism, there are plenty of athletes contributing in all three phases for championship contenders. Take Mashpee senior two-way end Xavier Gonsalves, one of the main weapons on the only MIAA team with a longer winning streak (25 games) than Everett. 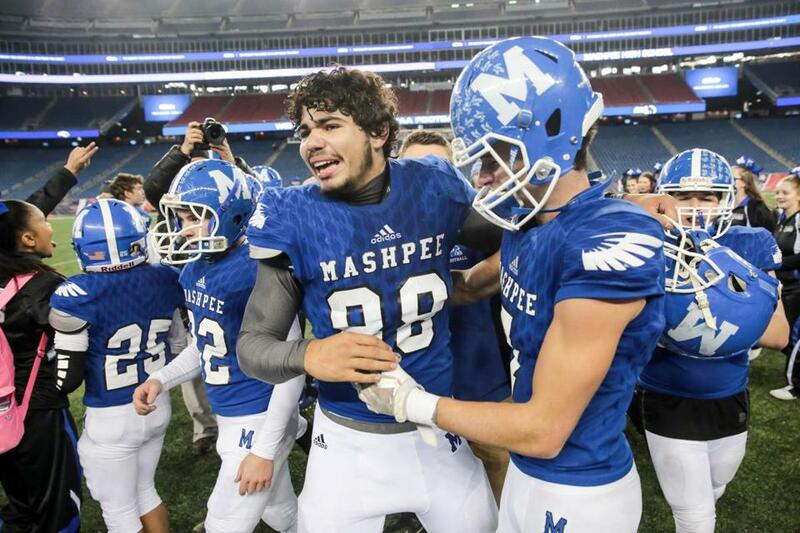 Mashpee two-way end Xavier Gonsalves (88) helped his team to a Super Bowl win over Blackstone Valley at Gillette Stadium in Foxborough last December. The 6-foot-3, 245-pounder has four touchdown receptions and has kicked four successful extra points through five games. Last season, he recorded 17 sacks and 65 tackles as the South Shore Tobin Player of the Year. Gonsalve is also one of the best punters in the state for the three-time defending D7 state champions. Versatile players like Gonsalves can be even more valuable at smaller schools. “I expect it with the amount of kids we have,” Gonsalves said of playing three ways. Playing nearly every snap of a football game requires elite fitness. But for a player like Danvers senior Matt McCarthy, the sacrifices required to prepare for a heavy workload outweighs the helpless feeling of watching plays from the sideline. McCarthy began his senior year by taking the opening kickoff 93 yards for a touchdown in a Week 1 win over Masconomet. Despite a perceived lack of size at 5-feet-11-inches and165 pounds, the running back/defensive back refuses to slow down. He dragged would-be tacklers en route to a fourth straight three-touchdown game last Friday, totaling 239 yards on 33 carries in a key 29-20 Northeastern Conference win over Lynn Classical. McCarthy hopes to lead Danvers to a NEC title by continuing to produce in home games against Beverly and fellow undefeated rival Marblehead the next two weeks. A few three-phase stars have derived a little extra motivation from facing their rivals the past couple weeks. Acton-Boxboro quarterback Finn Murray runs behind teammate Alex Berrouet in a 37-35 victory over Dual County League rival Lincoln-Sudbury. “I want to have a say in what happens in all three phases,” Murray said. 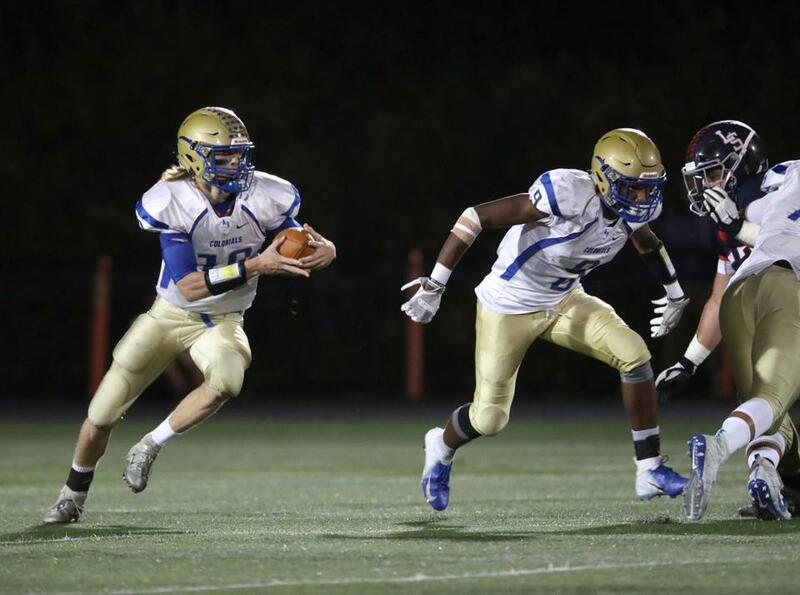 Acton-Boxborough quarterback Finn Murray and wide receiver Vic Otero experienced years of dejection at the hands of Dual County League power Lincoln-Sudbury. But after helping A-B upset L-S in the D1 North boys’ lacrosse sectional final last spring, they teamed up once again to stun the Warriors on the gridiron, 37-35, in Week 4. Murray also stars at safety and is the primary kicker for the Colonials. Otero returns kicks, plays defensive back and stars at wide receiver, catching a 5-yard touchdown pass from Murray as time expired to defeat L-S.
Stoneham is also coming off an emotional win, having upended Melrose, 40-14, to set up what could be the program’s first Middlesex Freedom League title since 1994. The engine behind Stoneham’s success is another three-way star, senior Christos Argyropoulos. As the lead back in the Spartans’ double wing attack, he’s rushed for 13 touchdowns. As a linebacker, he’s the team’s second-leading tackler, and he also returns kicks. “The reality is you wish you had more one-way players, but given our numbers, we’re not able to do that,” said Stoneham coach Bob Almeida. North Andover’s Gabriel DeSouza and Braintree’s Billy Silvia are two more stars who rarely come off the field. Dynamic playmakers on offense and defense, they’re two of the better kickers in the state and rank second and third amongst D2 point leaders, respectively. 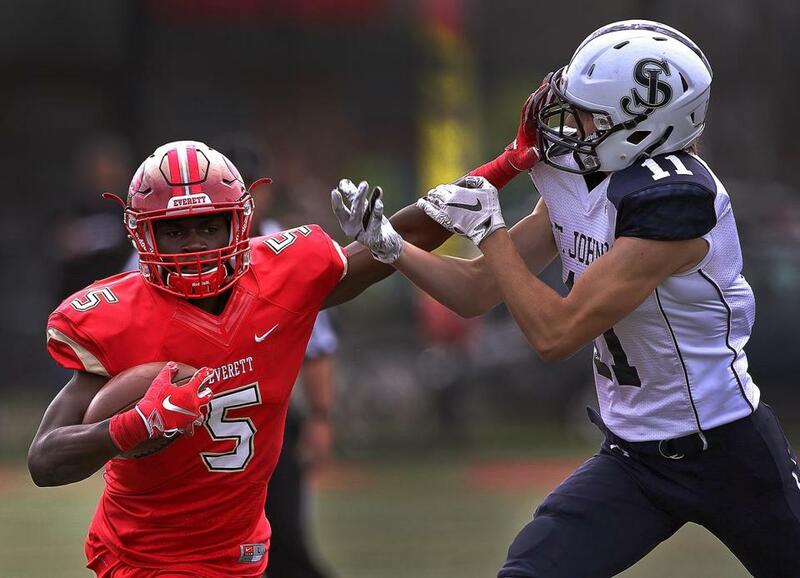 St. John’s Prep is leaning on two senior leaders, Wes Rockett and Aise Pream, who stand out in all three phases, while Catholic Memorial also features a game-breaking athlete in Khari Johnson. Everett’s Mike Sainristil may have the versatility and athleticism to pull off being a three-way player at the next level in college. It’s common for players to star in all phases at the high school level, but Sainristil may become one of the select few three-way players at the collegiate level next year. “It’ll definitely be a lot harder, just because the game is faster, more physical,” Sainristil said about playing three ways at the next level. Considering the success he’s found playing different positions from the time he helped Everett Pop Warner win a national title in eighth grade, Sainristil should be ready to adapt to the challenge.